Labouche peak is the combination of the best trekking trail in the world. listed in world natural heritage site and a mountain to climb that is above 6100 meters, makes this trip one of the best combination of trek and adventure. Labouche Peak which is only few hours before from Everest base camp. 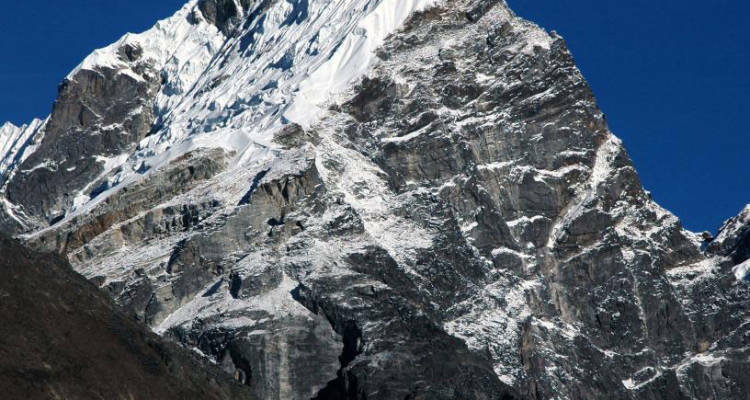 The climb gives you one of the most spectacular views of Everest including Lotse 8516 and other peaks raging over 6500 meters and the Khumbu glacier. This trek is not only about Labuche peak climbing adventure but in-depth introduction to Sherpa culture. We pass by some of the largest villages in Khumbu valley, spend time in visiting monastery to know their culture and visit villages to know more about their daily life. The trek starts with one of the most scenic flight to Lukla on a hillside built in 1962. 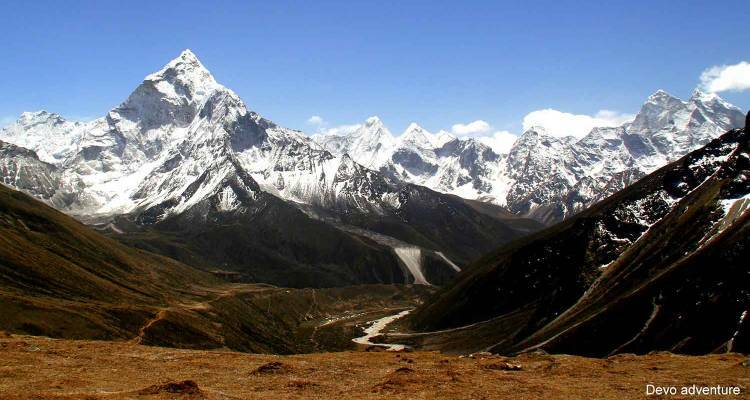 After follow the Khumbu valley for Everest base camp trek which will be an acclimatization with great scenery of Himalaya. Then the final ascend for Labouche peak climbing in the land of Sherpas and the famous climbers. Everest Base Camp 5360m, Kalapatthar (5545m) view of Everest (Highest point on Earth 8848m). View of Lotse (8501m) 4th highest, Makalu (8463m) 5th highest in the world and Khumbu glacier and ice fall. Meet the Sherpa people (famous for climbing Himalayas) and know their culture and the Monasteries the most famous monastery in Khumbu valley. Adventure mountaineering experience with Labouche Peak climbing. Day 01: Arrive in Kathmandu: Our representative will be in airport to receive you. In the evening briefing about the trip. Day 03: Kathmandu to Lukla (2840m) to Phakding (2630m) 40 minutes flight 4 hours, 100m uphill, 380m downhill, Lodge. Day 06: Namche Bazaar to Tengboche (3830m), 5-6 hours 620m uphill, 230m downhill, Lodge. Day 07: Tengboche to Dingboche (4350m), 4-5 hours, 520m uphill, 150m downhill, Lodge. Day 08: Dingboche Acclimatization day to Chhukung Valley or Amadablam view point (4760m) 710m uphill, 720m downhill, Lodge. Day 09: Dingboche to Lobuche (4910m), 5-6 hours, 640m uphill, 90m downhill, Lodge. Day 10: Lobuche to GorekShep (5153m) to Everest Base camp (5360m), 450m uphill, 270m downhill, Lodge. Day 11: GorekShep to Kalapathar (5545m) to Lobuche (4910m), 425m uphill, 665m downhill, Lodge. Day 12: Labouche to Labouche east high Camp (5435 m) 4-5 hours, 525m up hill. Day 13: Labouche high camp to labouche summit 6119m and back to high Camp. 9-10 hours. Day 15: Labouche high camp to Pangbouche or Tangbouche 3945m/ 3830m, 8-9 hours. Day 16: Pangbouche/Tangbouche to Namche Bazzar (3440m), 6-7 hours. 570m uphill, 1170m downhill, Lodge. Day 17: Namche Bazaar to Phakding (2630m), 100m uphill, 900m downhill, Lodge. Day 18: Phakding to Lukla (2840m), 380m uphill, 100m downhill, Lodge. Day 19: Lukla to Kathmandu: 40 minutes flight, Complimentary massage, Hotel. Day 20: Departure Day. A day to say goodbye and to take happy memories back home :). Day 11: GorekShep to Kalapathar (5545m) to Labouche (4910m), 425m uphill, 665m downhill, Lodge.